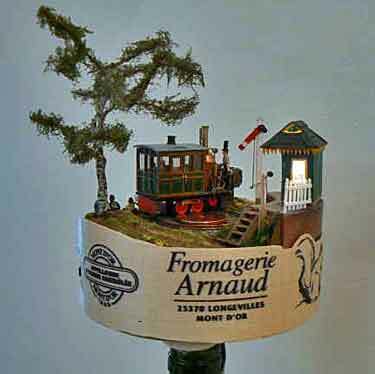 Tuppenny Handley—Cheese, wine and a railway… ahhh! 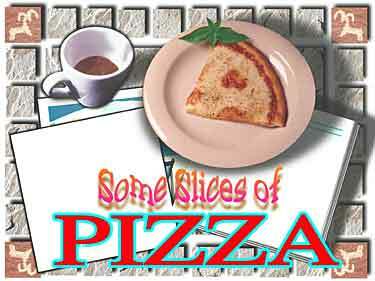 3 Pizzas – 1 Builder—Alabaman scores pizza hat trick! elegant modeling skills. Here are some recent examples. For the past decade, Fantasonics™ Engineering has featured a delightful imaginary railroad, The Incredible Dizzying Heights Railroad, on their popular website, “The Model Railroad Magic Website.” This little “railroad above the clouds,” shown in a series of drawings (like the two flanking this paragraph) by artist Dan Sawatzky, has fired the imaginations of thousands of model railroaders. 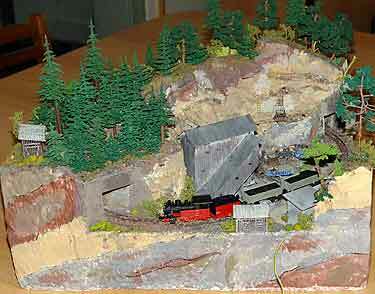 Now Andrew Milner, from Huddersfield, West Yorkshire England, has created a magical OO9 model of this fabled line, naming it Summit after the principal station on the Fantasonics railroad. Though this layout isn’t square like most pizzas, it is an unbroken circuit and thus topologically equivalent! 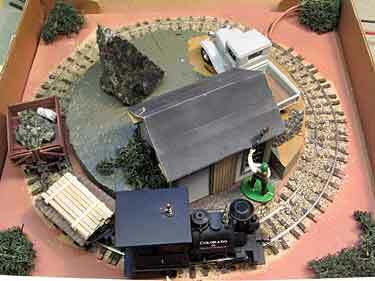 The layout measures 36x12in (90x30cm) and was built as a module for an eccentric modular layout created by members of the online Cheshire Railway Modellers, where independent OO modules were designed so they could be joined to create a cooperative layout. 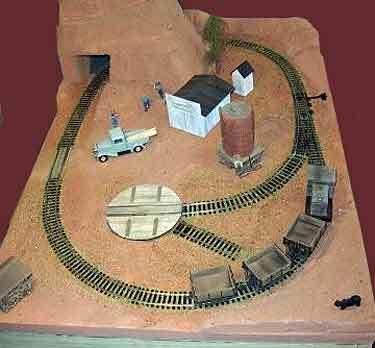 (This explains the OO track at the lower level of Andrew’s layout.) Summit premiered, alongside the other members’ modules, at the club’s annual show in January 2009. 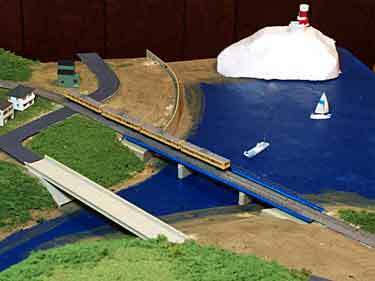 Originally designed by Fantasonics founder Jim Wells, the IDH Railroad as drawn for the web has delighted the many model railroaders who have visited the website. Fantasonics creates and sells innovative ambient sound recordings that help bring layouts and their locales to life. 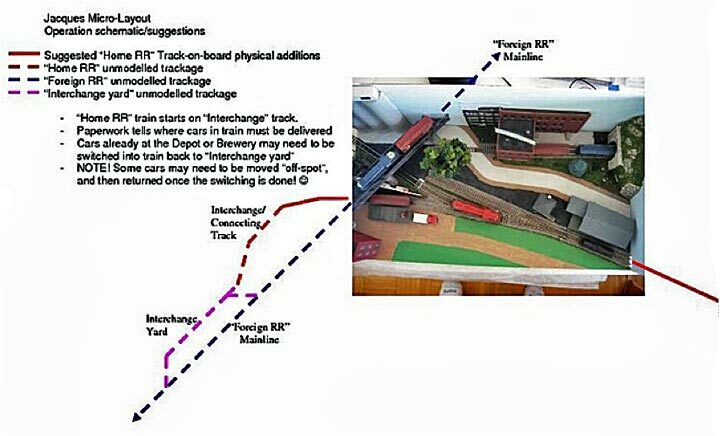 Now this charming model can bring the IDH to an even broader audience. You can view it in operation on the video clip below (which, ironically, is soundless)! Ian Holmes, from Princeton, Minnesota USA, is cramming an entire region of Japan into his 3x2ft (90x60cm) T gauge (1:450 on 3mm gauge) layout, Gonou. 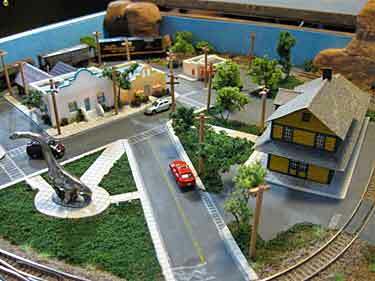 This tiny scale allows modelers to build extensive landscapes in very tiny spaces! Ian reports, “It’s built on one of those cork-faced notice boards [bulletin boards]. 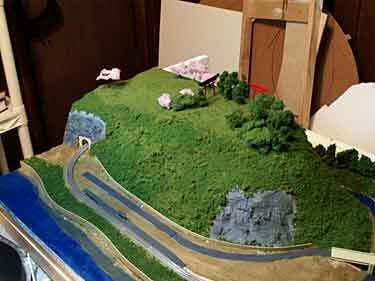 I covered that with some white foam to lay the track on and cut the mountains from white foam also. 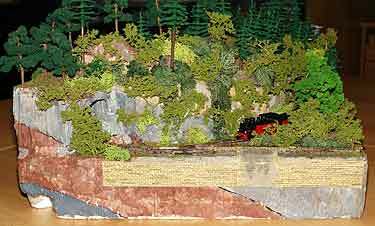 The model is inspired by pictures of the Gonou line in Aomori prefecture in Japan (hence the name). T gauge, introduced two years ago by the Japanese firm, KK Eishindo, is the smallest size operating model train scale commercially available. It has had teething problems, as described in Scrapbook #78a. Ian reports that train running is improving these days, and with the impending introduction of a pulse-width-modulated controller, should be much smoother. 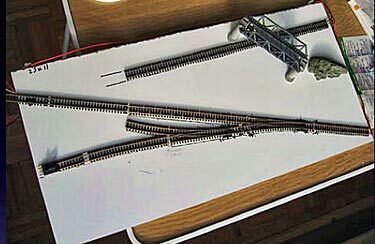 You can follow Ian’s progress at his blog, More T Please (which also provided the small photo (above right) illustrating T gauge’s incredibly small size). Ian’s current project is scratchbuilding a 1:450 gas station, including scale gas pumps measuring 5x3mm! 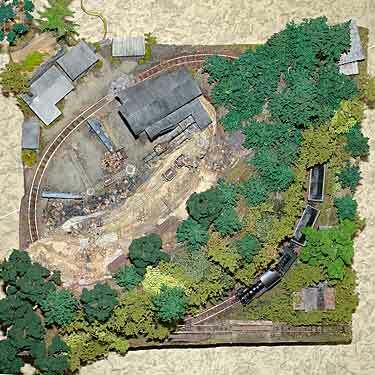 Gerhard Sonnenberger, who lives in Meckenheim (near Bonn), Germany, built this two-sided N scale layout on a 60x50mm (24x20in) base. Gerhard explains, “The theme is Indian Summer in Canada, where we spent our holidays in 2006. Background scenery is a photograph I took in Algonquin Park, Ontario. Visitors can drive to ‘Beaver Creek Falls View Point,’ and if they are lucky they may watch some bears.” Gerhard tells us not to worry that the Sante Fe has lost its way and arrived in Ontario—he’s planning the second side now, and the ATSF may well reach Monument Valley! Pizza layouts are often built as household decorations during a holiday season. 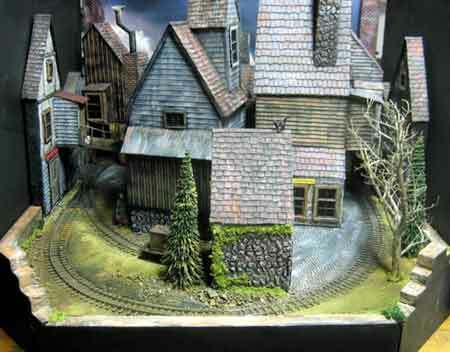 Here are two examples from two different U.S. modelers. Steve Simmons, from La Mirada, California, built this HO Christmas pizza layout with a friend’s young children in mind. Steve notes, “The platform is made from 12in (30cm) foam circles purchased from a craft store and stacked to give height. It is wrapped in sheet balsa and varnished. The mountain is foam as well. The buildings are porcelain from the craft store. The tree has battery-powered Christmas lights, and the buildings are also lighted. 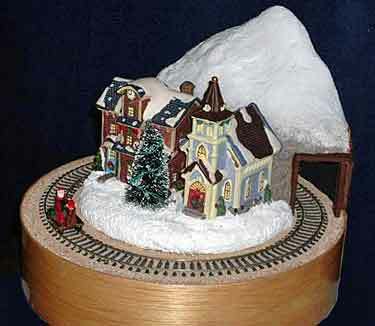 A Bachmann Santa Gandy Dancer scoots around the village. Track power is provided by a universal charger for phones and computers, with output settings from 3-12v to control speed.” Steve is currently working on an On30 version in the same size. 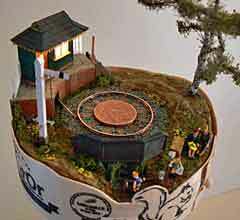 “Střelek,” from Plzeň, Czech Republic, built Mount Bonsai, his “test pizza,” in a 50x45cm (20x18in) space. Scale is H0e (1:87 scale on 9mm gauge). 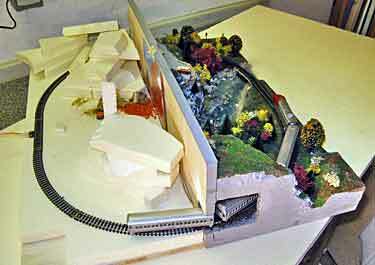 The layout features Roco feldbahn track with one manual switch laid on a styrofoam and paper foundation and armature for the hills. His prototype is the wild, natural landscape of the Czech Karst (Český kras), which stretches southwest from Prague. 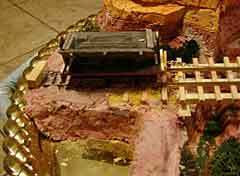 The scratchbuilt structures are based on the Mořina and other limestone quarries in the area. Notice the seldom-modeled strata showing in the earth. EXTREME CHEESE PIZZA IS WORTH AT LEAST TUPPENCE! 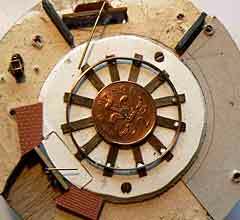 Phil Savage, from Brighton, England, based his H09/OO9 pizza (1:87 or so on 9mm track) around a Victorian 2p piece, generating the name Tuppenny Handley. Laurie Maunder, a fellow OO9 modeler, helped out with the trackwork, and Phil fortuitously found a cheese box (empty, alas) that was just the right size (just under 6in/15cm diameter) to hold the circular trackwork. From there, Phil declares, it just sort of grew. 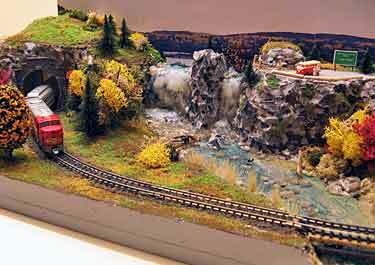 The vertically-boilered railmotor is scratchbuilt on an N-scale chassis. And there’s more. 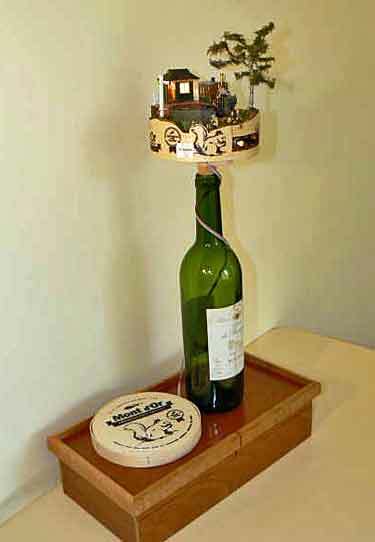 The cheese box housing is corked into a wine bottle, which sits on a box ‘tray’ containing the controller, transformer, panel and auto-start timer. Amazingly, and much to Phil’s credit, the whole thing works! Greg Trickey, from Devon, England, continues to develop his OO pizza layouts, designed as ever-more-sophisticated playpens for his son, Sam (see Scrapbook #79a for the previous iteration of the series). According to Greg, “The other one was too big and he could move things around only from the outside. He now has a central operating well to get in and out plus a mini sidings.” Presumably this is a great way to introduce very young people to the hobby! ALABAMAN GETS THE HAT TRICK — THREE PIZZAS! John Lucas, from Troy, Alabama USA, sent us details of three pizza layouts he’s recently built (John specializes in pizzas—see Scrapbooks #67a, #72a, and #79a). The first one is unique… it’s a straight-line pizza! Built on a 16in (41cm) diameter platter (from an after-Christmas sale), Tres Cruces Mine is an On30 variation on El Dorito Mine (also see Scrapbook #83a). John explains, ” To keep things simple, I have the loaded hoppers reach the bottom by gravity and use a chain and manual winch to pull them back up the hill. 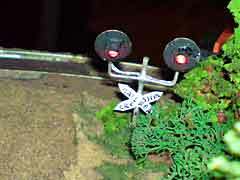 The cars are being scratchbuilt from popsicle sticks and HO scale trucks… I wanted to show what you can do with inexpensive scenery materials. 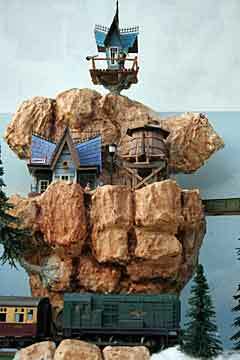 The scenery is made from styrofoam insulation and Cell-U-Clay. The track is an old section of brass HO code 100 track placed on new stripwood ties. The structures are scratchbuilt from popsicle sticks. The water is made with acrylic gloss medium. 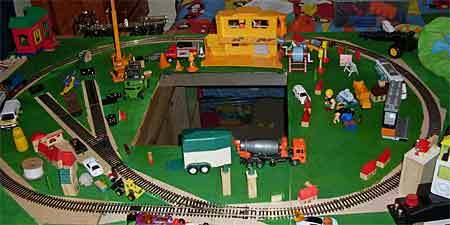 (Above left) “Pumpkin Hill is an N-scale layout that I built for a Halloween pumpkin carving contest at work. The ‘hill’ is a $1 plastic pumpkin from Wal-Mart. The track is Kato Unitrack. When I exhibited the layout, I stuffed the pumpkin with candy. I didn’t win, but the layout was pretty popular!” You can see it in action on YouTube. 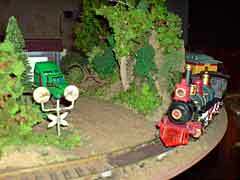 (Above right) “Squarefoot Hoedown was made from a $1.99 train set from Walgreen’s (talk about your budget models!) and some Cowboy Christmas figures. 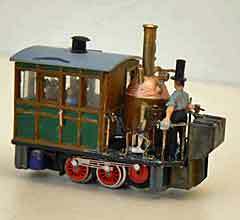 The train is powered by an AA battery in the boiler and is controlled by an on/off switch on the side. it’s roughly TT scale and doesn’t look bad once painted. 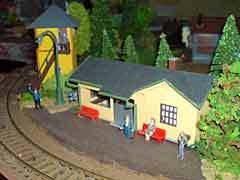 The figures are probably about 1:32, so I envision it as a backyard train. In the spirit of Christmas, I gave the layout as a Christmas present to a friend.” There’s also a YouTube video of this one in operation. 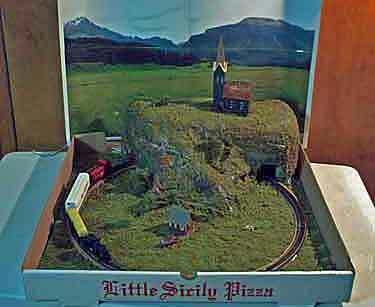 Bliss Bignall, from San Angelo, Texas USA, is a true pioneer… he built the first layout ever identified as a pizza to appear in the Small Layout Scrapbook. Check out Issue #1 to see Bliss’s four-foot-diameter On30 pizza, built for display in his local train depot! We’ve both come a long way, baby! Bliss sent along a photo of his current On30 project, a 32x22in (81x56cm) loop with 10-inch curves. 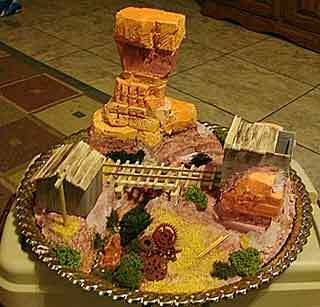 Bliss comments, “I call it Matthew’s Mine, though the miners are just getting started… The scenery is still missing a few green things, and maybe a cactus or two, but it’s otherwise done. A turntable built on a CD, an idea from your site, is used, and the track curving to the turntable is so sharp the engine actually skids around the corner! From Alexander Shustov, who lives in Puchino, Russia, come photos of his pizza layout, Little America. 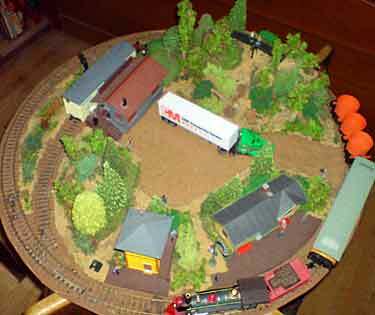 A big fan of Buster Keaton’s classic movie, “The General,” Alexander runs a Bachmann HO model of a 4-4-0 similar to the prototype “General.” The layout is 56cm (22in) in diameter. 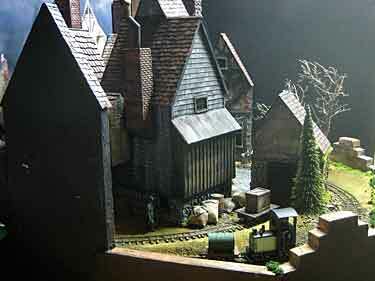 Layout highlights include a working light signal, a working illuminated “”Railroad Crossing” signal, a scratchbuilt dummy curved turnout, and working lights in the buildings. Relays to control the light signal and crossing guard are concealed underneath the hill. 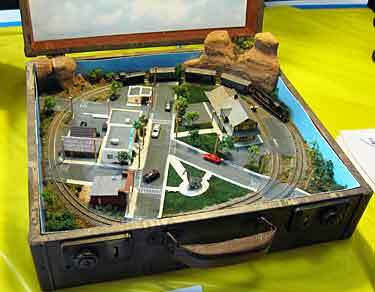 While visiting the Hostlers Model Railroad Festival in Ogden, Utah USA, reader Joshua Bernhard noticed and photographed several delightful Z scale layouts built in briefcases. Thanks are also due to Lee Witten of the Hostlers MR Club, who helped us track down the builder—Tony Brucia, from Park City, Utah USA. 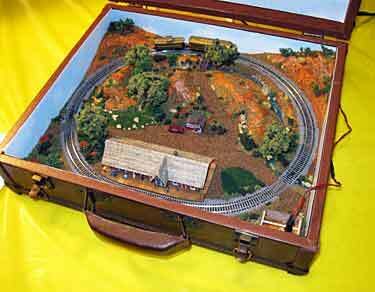 Tony and his associate, Michael Denis John, create and sell these small Z-scale briefcase layouts, on eBay and at train shows. They’re also both members of the Wasatch Z Club. As soon as their web page is up we’ll link to it here. Meantime I’ll be glad to forward any inquiries. 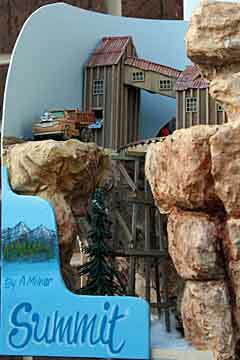 The larger Z layout in Joshua’s photos, with the Dinosaur in the Park, measures 15x14in (38x35cm), has all buildlings lit, and contains an MRC sound unit. The smaller layout is 14x11in (35x28cm). Frequent contributor Jon Songøygard, from Arendal, Norway, sent a pair of pizza designs, one small scale and the other large. The smaller layout, Little Sea (or Lillesjø in Norwegian) is an unusual shape—but it will still fit into a square pizza box! Jon provided some insight into the design process. The second layout, Gn15 Wall, is one that Jon may well build. He says, “The main feature here will be a large factory wall (almost two feet wide, and a couple of stories high) plus a shed in front. The grey area at the back will be my fiddle yard, and I guess I’ll make it possible to put a hand into the front shed from behind too, for switching loads and such.” Jon also commented that another challenge will be finding an HO drive mechanism that will navigate the 4in (11cm) radii of the loop, so he can build a Gn15 (1:22.5 on 16.5mm gauge) locomotive on top of it! WHAT THE DICKENS IS THIS… A PICKWICKIAN PIZZA? 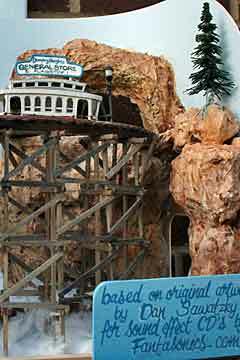 Gerry Snelson, from Frostburg, Maryland USA, built his second Gn15 layout as a very atmospheric continuous loop. His first layout (Scrapbook #77) was a straight-line shelf. This one measures 44x33in (112x84cm) and is designed to look like a 19th century Victorian town served by a tiny narrow-gauge railway. In all there are 10 buildings—seven 3-D and three in low relief—that display a remarkable array of rooflines! The anachronistic locomotive shown at lower left is a gas-mechanical placeholder borrowed from Gerry’s previous layout while he was building his new, Victorian steam engine (lower right). Designed to look like the 15-inch gauge locos of Sir Arthur Heywood, this new engine is very fitting for the atmospheric layout she inhabits! 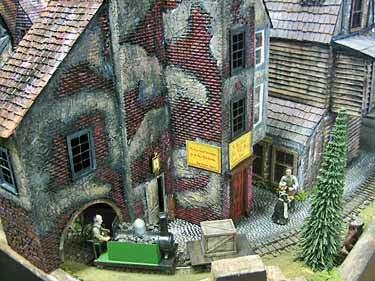 For more information about this remarkable layout and how it was built, download the Gn15 Tome issue for January 2009, which has a long, illustrated article by Gerry. There’s also a good photographic essay on the layout at Henrik Laurell’s website.